Chances are good that along the way you'll discover something you haven't seen before, or see something in a brand new way. Either way, enjoy the view. Commissioned by Bluffton's call of 1962, Peacesounds is a large wind chime that stands in Riley Court at the top of the path that winds down to the peace arts center. The 10'-high, stainless-steel edifice was created in 1989 by Jaye Bumbaugh, a 37-year veteran of Bluffton's art faculty. The multicolored tubes-representing different countries-produce gentle, muted tones that remind visitors of the possibilities for living a peaceful, harmonious existence. Just outside the doors of the peace arts center, artist Jon Barlow-Husdson uses a variety of media to replicate the Berlin Wall, a prison wall, a stockade wall and the Vietnam War Memorial. creating Peace Wall and Moon Gate. The interactive art experience represents how individuals in a society use walls to close people out, hold them in or immoratlize them. Imprinted on three of the walls are names of those wo have spent their lives working for peace and justice initiatives around the globe. Viewers may pass through the moon gate, which represents unity and completeness, as a symbolic gesture of refusing to allow walls to separate them form others. Installed in 1994, the sculpture is part of The Honda Outdoor Peace Sculpture Garden. Standing outside the peacearts center, Peace House by artist Jack Mann is a stainles-ssteel sculpture that suggests some peaceful and not-so-peaceful meanings of the word “home.” A nest of birds with a cat hovering below. A haven where children create and act out their dreams. A place where everything is turned upside-down. Installed in 1994, Peace House invites those whose faces are reflected in the sculpture’s mirror-finish to think about “home” and to place within one of the four rooms something from their world that can make Peace House a personal experience. The sculpture is part of The Honda Outdoor Peace Sculpture Garden. 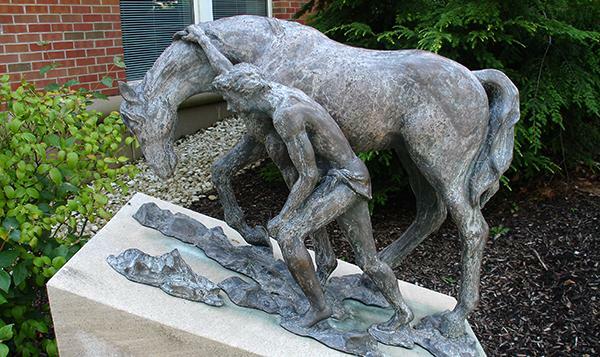 In this bronze sculpture, Bluffton faculty-artist Gregg Luginbuhl re-creates Jonah’s deliverance from the whale as an acrobatic resurgence, a kind of spiritual transformation. Luginbuhl shows Jonah moving through a series of stages, from disobedience and desperation to spiritual rejuvenation, with the hope that viewers will find comparisons to Christ’s crucifixion and resurrection. Surrounded by stone seats, visitors are invited to sit and think about their own experiences of transformation from chaos to peace. The sculpture was installed in 1994 and is part of The Honda Outdoor Peace Sculpture Garden. 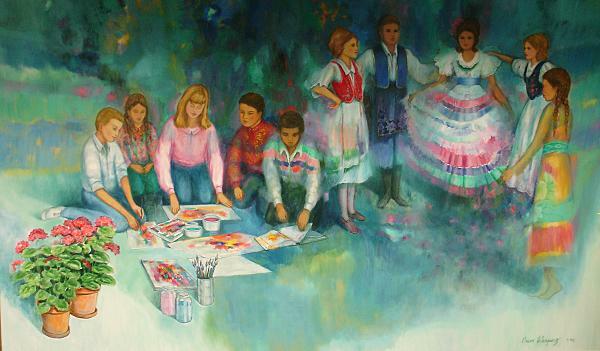 Revealing that art has no language barriers, this colorful 6’ x 10’ oil painting by Oscar Velasquez canvasses a wall in the peace arts center and depicts children of different races and cultures playing together. Some of the models for the mural were children the artist met on a visit to Serbia in 1994 and others were peace arts center workshop participants. The mural was installed in 1995. Also inside the peace arts center are a number of Ronald Himler’s ink illustrations from Eleanor Coerr’s book Sadako and the Thousand Paper Cranes. The illustrations tell the story of the atomic bombing of Hiroshima and of Sadako, a young Japanese girl affected by the bombing. According to Japanese legend, if one folds 1,000 paper cranes, one’s wish will come true. Sadako’s wish is to overcome leukemia. While she eventually succumbs to the disease, her persistence and the dream of peace live on. Along the Little Riley Creek, near the sidewalk that leads from Sauder Visual Arts Center and Riley Court to Marbeck Center, rests a configuration of circular granite stones. Designed to be a setting where constructive dialogues can occur, Peace Thrones is modeled after three thrones once created for chiefs of three warring tribes. As the story goes, per the artists, three aboriginal tribes were at war with one another. After many years, with no tribe emerging victorious, a common area was built where the three leaders could engage in dialogue. 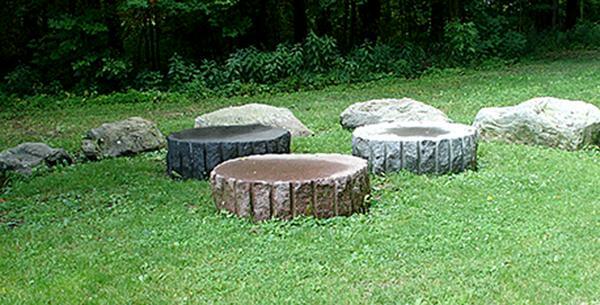 Peace Thrones consists of three granite discs, in black, red and white, equidistant from one another—an arrangement with no social hierarchy. The artwork was made possible by the efforts of Dr. Elizabeth (Rumer ’68) Hostetler, former director of the peace arts center, and a grant from the Ohio Arts Council. The structure was dedicated in 1994. Perhaps John Klassen’s most celebrated work at Bluffton, his limestone sculpture The Blind Kobzar, now seated in Marbeck Gallery Lounge, depicts a blind Ukrainian minstrel, or kobzar, holding a lute-like instrument. Created ca. 1930, the piece is modeled after a larger-than-life kobzar statue that Klassen was commissioned to create before he left Russia. The commission was abandoned at the direction of the Soviet government for political reasons. 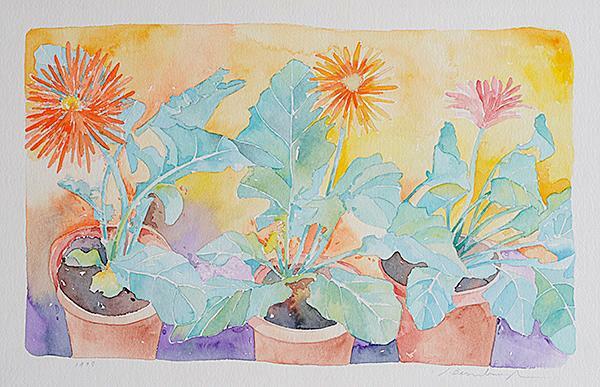 Klassen joined the Bluffton faculty in 1924,and his contributions over the course of 36 years fortified the institution’s fledgling art program. In this mix of ceramic and concrete, Jack Earl creates a light-hearted and contemporary version of John Klassen’s Blind Kobzar. This time, the kobzar cradles a casuallydressed student. Books sit atop the kobzar’s head, and coffee from an overturned mug trickles down to the base, where a dogsleeps. The student, presumably Bill, is immersed in a book. The artist says the student represents both his alter ego and every man. While the college student is eager to learn, he brings with him several items and behaviors that deviate from academic decorum. The learning process, however, is such that a first-year student can work in harmony alongside a seasoned professor. Originally installed in 2001 as a part of the Centennial Sculpture Garden that surrounds Centennial Hall, the piece was moved indoors to Marbeck Gallery Lounge due to deterioration. converted into an elite military class. Situated between Centennial Hall and Founders Hall, this concrete bust of Menno Simons by Jack Earl watches over campus from atop a pedestal. It is a “Bluffton-ized” reproduction of John Klassen’s marble bust of Menno Simons that resides in Musselman Library. Here, Menno is lifesized and dressed in a Bluffton Varsity jacket. limestone piece, perhaps one of his finest.